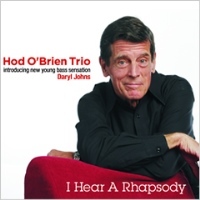 Description: Hod O'Brien, who turned 77 in January 2013, is a living legend and one of the best bebop pianists working today. His strong touch and sense of swing invigorate every tune he plays. On his fifth album for Spice of Life, O'Brien features Daryl Johns, a young bass sensation who was only 16 years old at the time of the recording. Johns was a semi-finalist in the 2009 Thelonious Monk International Bass Competition when he was just 12, and this is his debut recording. His father Steve, an accomplished drummer who plays in New York, lends his hand both as the drummer and co-producer. A collection of lyrical standard songs and well-known bebob tunes by Oscar Pettiford, Tadd Dameron and Bud Powell, this CD is an in-the-pocket, straight-ahead affair. Daryl is given ample space to show off his skill and ability, which are quite amazing, indeed. The trio swings very well, and O'Brien's confident, unwavering bebop spirit is most impressive. Look forward to hearing more of Daryl Johns, a bright young jazz bassist! Recorded at Sonic Park Recording Studio in Paramus, New Jersey on December 19, 2012.